Hi, everyone! Thank you for stopping by to link up your Must Try recipe….but I’ve got nothing this week :). I just finished hosting a baby shower for my sister. A long awaited, much deserved baby shower that is. My mind is spinning with the fabulous food that was made both for the shower and leading up to it…..Apple Pie Dip with Cinnamon/Sugar Chips, Pumpkin Snickerdoodles, Honey Beer Bread….the list could go on! So, this week I’m not sharing a recipe because, simply, I didn’t make time to get the post ready. However, I am going to leave you all to linking up and sharing YOUR favorite must try recipes with all of us. Thank you all so much for being faithful party goers :). I absolutely love it! Some awesome things are coming your way this fall on My Favorite Finds. Yummy recipes, family fall fun, fall home decor, and even a Minnie Mouse Birthday Party! 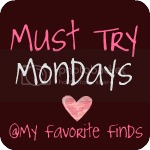 Have a great week, and link up your Must Try Recipes below! What a fun reason for not having a recipe ready! Hi Carrie! Thanks so much for hosting! Hope you have a nice week ahead! So fun to be featured! So glad you enjoyed and thanks for the shout out. I'm linking up a favorite this week. Thanks for hosting a great party! YUM! I don't have anything to link up for this post but I love looking at everyone's recipes! Amazeballs!!! This link up is going to make me an amazing hit in my house full of boys LOL. I may not contribute to the link up but will definitely be trying some of these recipes out!!! I'm your newest follower from the gfc blog hop…thanks for co hosting! This looks so neat to make! Have a great night! Come by nichollvincent.blogspot.com and say hi!